I’ve run many half-marathons and mini-marathons over the years as goal races, with training programs that had running and tapering specifically for those events. I’ve never run a half-marathon inside of a training program for a different race. I made this spontaneous decision just hours in advance, but I’m doing all sorts of new things this year in my quest to conquer the marathon. 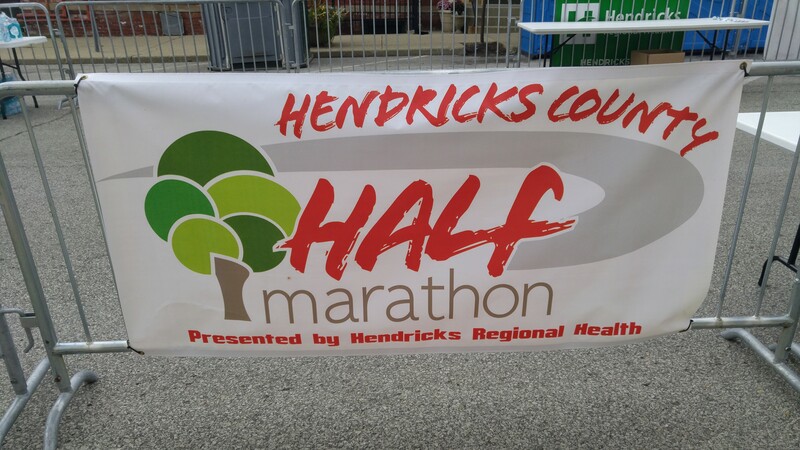 At the end of this week, I replaced a scheduled sixteen mile run in the Indy Runners training program with the shorter Hendricks County Half-Marathon. I intended this event to be a tune-up for the Monumental Marathon that is just two months away and a test of my current level of readiness for the true goal race. I arrived in Danville Indiana for registration at 6:30 am, entered the corral with a small group of fellow runners at 7:25 am, and started the race at 7:30 am. The course followed approximately a rectangular path to the west, south, east, and north through central Hendricks County Indiana farmland, and scenery was mostly corn and soybean fields except for the residential neighborhoods in town at the start and finish. With less than a hundred runners participating in the event, roads were not closed to vehicular traffic and spectators were nowhere to be found. My split times were 10:20 minutes for mile 1, 10:13 minutes for mile 2, 11:17 minutes for mile 3, and 9:59 for mile 4. My pace was uneven because I wasn’t prepared for the hills, having done most of my training so far on perfectly flat rail trails, and upon seeing how slow was my third mile, I made sure not to run that slow again. My split times were 10:16 minutes for mile 5, 10:14 minutes for mile 6, 10:19 minutes for mile 7, and 10:21 for mile 8. I finally settled into a steady pace, though if I was better rested for this event, my pace would have been closer to an even ten minutes per mile. My split times were 10:36 minutes for mile 9, 10:23 minutes for mile 10, 10:16 minutes for mile 11, and 10:05 for mile 12. I was then speeding up for the thirteenth mile but was surprised to see the finish line before I expected it. I didn’t fully understand at the time, but I had gotten lost. 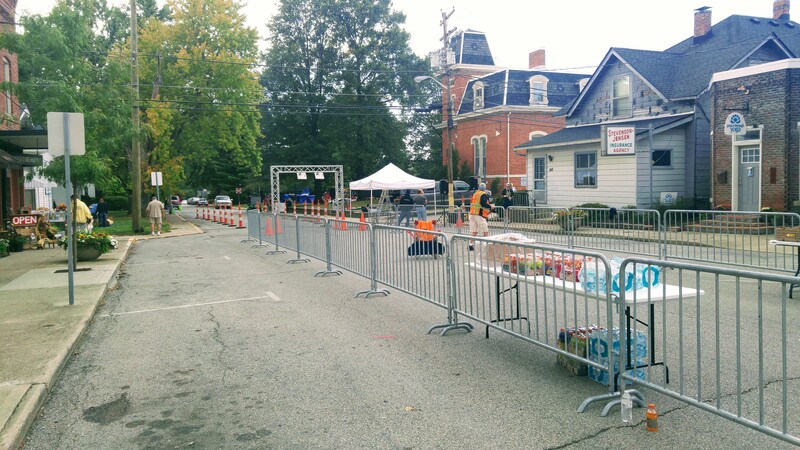 With so few runners involved in this event, I couldn’t see the runners ahead of me as the course made some turns in the town’s residential neighborhood, and there were no volunteers providing directions. It was only after I got home and compared the course as posted on the event’s website with the course as recorded by my running watch that I realized that I missed a turn before the end of the thirteenth mile and skipped a few blocks that resulted in a shorter distance. I’m disappointed because my official finish time is not legitimate and therefore my effort in this event doesn’t really count as a half-marathon. ** 04-Sep-2017, 8.64 miles, 10:34 minutes per mile. From home through residential neighborhoods to rural roads, east on the B&O Trail to bridge over White Lick Creek, and back via same route to home. Weather was 64 F and sunny. ** 07-Sep-2017, 3.1 miles, 9.5 minutes per mile, on a treadmill. ** 09-Sep-2017, 12.48 miles, 10:27 minutes per mile. From Danville Town Square along rural roads in central Hendricks County and back to Danville Town Square, as a participant of the Hendricks County Half-Marathon. Weather was 61 F and partly sunny. Nutrition was Clif bar pre-run, small amounts of sport drinks at each of the first ten miles, and a banana post-run. Total distance this week, 24.2 miles. Music of the week, Halo by Juana Molina. As I prepare for the Monumental Marathon in November, I include a September half-marathon in my training program as an early tune-up for the goal event. After I crossed the finish line of the sparsely attended Hendricks County Half Marathon, the next runners behind me were too far back to be visible.